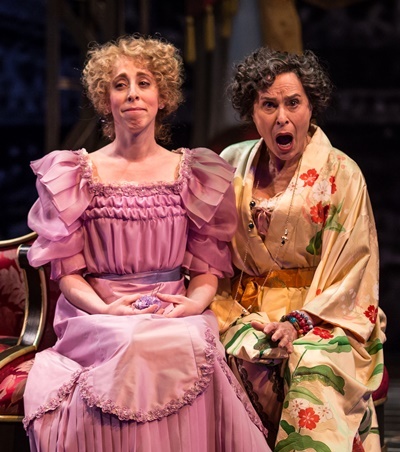 It’s Dolly’s world, the charming milieu and crazy circumstances of Thornton Wilder’s perdurable farce “The Matchmaker.” All the other characters on stage just live in it. 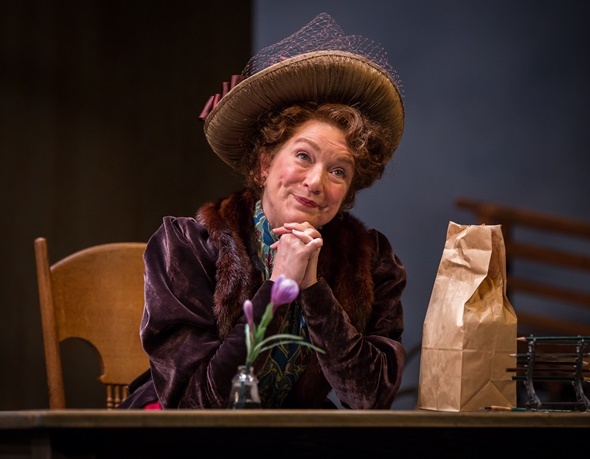 So say hello to a delightful Dolly whose world is well worth a visit in the Goodman Theatre production starring — with a capital S — Kristine Nielsen. “The Matchmaker” (1938) is hardly less fascinating than it is funny, and it’s very funny in this go-round directed by Henry Wishcamper. 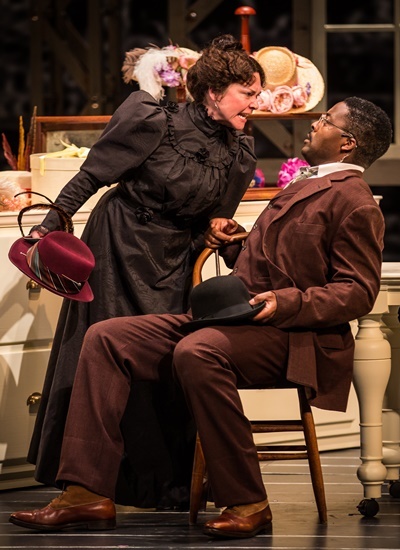 A dyed-in-the-wool period piece set immovably in 1896, the play might be called a comedy of outmoded manners. Only if the mirror is held just right do we see ourselves in it, and not just some bygone society where subservient women lived to do the bidding of crusty, presumptuous men. The middle-aged widow Dolly Gallagher Levi, embodied by Kristine Nielsen with equal parts of vitality and panache, dwells in exactly that sort of unequal habitation. But she is more clever by half than the men around her. Wit and wiles keep Dolly afloat. For many years she has plied the trade of matchmaker, but now she senses that the time has come for her to remarry; and to that purpose she sets her sights on the wealthy (not to mention tight-fisted and curmudgeonly) Yonkers merchant Horace Vandergelder, who late in life also has decided to marry. However, as a direct assault on Horace (played here with delicious pomposity and rigid vanity by Allen Gilmore) would never win him to husband (his eye is elsewhere), Dolly contrives to outflank him: Although she has set him up with a New York ladies’ hat-shop owner, Irene Molloy (the vivaciously sporting Elizabeth Ledo), Dolly plans to turn the tables to finagle Horace for her own. Stirred into this stew are Horace’s two employees, Barnaby and Cornelius, left behind to mind the store while the boss heads off to the city on his marital mission. But the lads decide a big-city adventure is just what they need, as well. They pool their meager funds, close the shop and go for it – and they aren’t coming back until they’ve both kissed a girl. The play’s all-out excursion into farce comes soon after Cornelius (Postell Pringle) and Barnaby (Behzad Dabu) hit the city, landing where else but in Irene Molloy’s hat shop just ahead of Horace and Dolly. When no-nonsense Horace is seen approaching, the boys scramble for cover under a table, in a closet, anywhere to avert discovery and disaster. As Pringle and Dabu throw themselves into the fun, you can’t help laughing till the tears come, and pulling for them to dodge Gilmore’s peevish Horace. These fugitives are of course spotted by both Dolly and Irene, who decide to play along. The romp is extended and the gags are riotous before Horace finally departs with Dolly; and Irene, getting the impression that Cornelius is a worldly and well-heeled fellow, demands that the two young men take her and her assistant to dinner at the same high-class eatery where Horace and Dolly are headed. While timing is a given in successful farce, a less obvious but no less crucial element is tempo: sustaining the hyper-comedic pulse without blurring the narrative line. Here is where Wishcamper’s adroit direction tells. The wackiness at the Harmonia Gardens Restaurant, with the two parties dining in close proximity but shielded from each other by a screen, builds slowly and fitfully as this fine ensemble of actors keeps the comedy at high pitch. The moveable hilarity shifts again, to the home of Horace’s old – seriously, old – friend Flora Van Huysen, a sort of superannuated proto-hippie in whose seclusion Horace has resolved to maintain his niece and ward Ermengarde (Theo Allyn). He intends to prevent the girl from marrying her beloved Ambrose (Ronobir Lahiri) until a more sensible choice can be found. But loopy Flora (Marilyn Dodds Frank in a scene-stealing turn) is all for the young lovers – even though identities get bollixed as the whole gang reassembles in her parlor and she’s not entirely sure which is who. 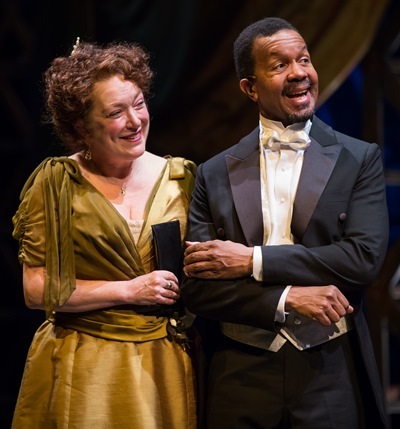 This effervescent show may be inseparable from its long-ago world (splendid costumes by Jenny Mannis and sets by Neil Patel), but its bridge to the present is made of eternal stuff: human need, compassion, wit. And we viewers are in the mix from the start. We, with hopeless generosity, provide the laughter.